Christmas has been a traditional time for the telling of tales of ghosts and the supernatural for many years, and the Edwardian author M.R. James’ short stories have become the most intimately associated with the season, as I’m sure needs no introduction to anyone reading this. One of his most highly regarded stories is “A Warning to the Curious”, first published in 1925 and adapted by the BBC in 1972 for their Ghost Stories for Christmas strand. 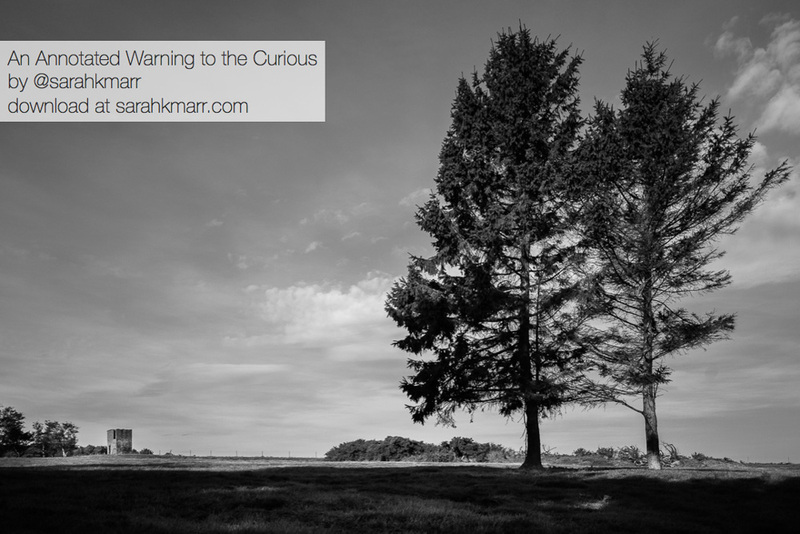 Author Sarah K. Marr recently published an immensely detailed annotated guide to “A Warning to the Curious” on her website which thoroughly explores all aspects of the tale, accompanied by evocative photographs, illustrations, maps and much more. Sarah kindly agreed to speak to Folk Horror Revival about the project. Folk Horror Revival: Hi Sarah, thanks for agreeing to talk to us at Folk Horror Revival. Can you introduce yourself please? Sarah Marr: Hi, Folk Horror Revival. I’m Sarah K. Marr, and I’m a writer living near London. I published my debut novel earlier this year—pretty sure I’m contractually obliged to say, All the Perverse Angels, available through all good bookshops—and now I’m turning my thoughts to writing the next one. You can follow me on Twitter, @sarahkmarr, if that’s your thing. Anyway, you’re talking to me because of my guide to M.R. James’s “A Warning to the Curious”. FHR: What led to your fascination with the works of M.R. James and folk horror in general? SM: I first read James when at I was at school, and then, some years later, I revisited his work whilst I was living alone in a small, old cottage in the Cotswolds: a perfect environment for those stories. For me, James provides the quintessential model for the English ghost story, the ‘urtext’ from which everything else is derived. Having said that, I do realize it’s a very ahistorical perspective—one can see the influence of earlier works in James’s writing—and that there’s a certain sensibility necessary for becoming immersed in James’s stories. Still, at a personal level, “Is this as good as James?” is a test for any uncanny tale I read. I grew up in the seventies, so a lot of the ‘hauntological’ nostalgia—I use the term without negative connotations—which is around now harks back to my childhood: it’s still the Spirit of Dark and Lonely Water which keeps me away from disused quarries. Children of the Stones was shown when I was seven, and a year or two later my parents took me to Avebury, where we took it in turns to touch the stones and collapse with appropriate drama. I read Alan Garner, too, and was particularly fond of Red Shift and The Owl Service, both of which shift away from the more fantastical worlds of his Elidor or The Weirdstone of Brisingamen and carry elements of more earthly myth across time periods. I came to The Wicker Man—the ‘gateway drug’ of folk horror—quite a bit later, and I’ve had a stronger focus on folk horror in my reading over the past couple of years, partly as a way of exploring narrative and the construction of story for my own work. There’s also something about the way folk horror is so situated in the landscape which lends itself to photographic interpretation, and then, it seems to me, it’s a question of finding the balance between atmosphere and the avoidance of photographic cliché: I can’t claim that I’m always successful. FHR: Despite many of the books, films and TV series being around for many years it is only recently that ‘folk horror’ has become a ‘thing’. Do you have any thoughts on why folk horror has become such a growing area of interest to so many people? SM: It’s one of those things which has arisen from the coming together of many threads, and I’m certainly not the best person to assess them all. Partly, I suspect, it’s a reaction to a language of horror—particularly in films—based around the urban experience, and a desire to ‘reconnect’ with the wider environment. Then there’s the overlap with hauntology, in its broadest sense, and the revisiting of works from the 70s and 80s which itself was grounded in folklore. (Although that, of course, raises the same question about the reasons for folk horror’s prevalence in those years. Flight from the technological realities of the Cold War, perhaps?) There’s also the effect of key pieces and players which cross genres or spheres of influence: The League of Gentleman, for example, bridging horror through comedy, a span which Mark Gatiss so effortlessly crosses and recrosses, of course. Even having the term “folk horror” has helped creators and commentators to coalesce around a shared, if somewhat amorphous, centre of commonality. In a Twitter thread last year I managed to trace its use back to 1936 (in The English Journal, Volume 25, University of Chicago Press), but it’s only really become a mainstream term-of-art in the past few years. FHR: What was the thing that kickstarted the trip? Were you already familiar with the area so knew where to begin? 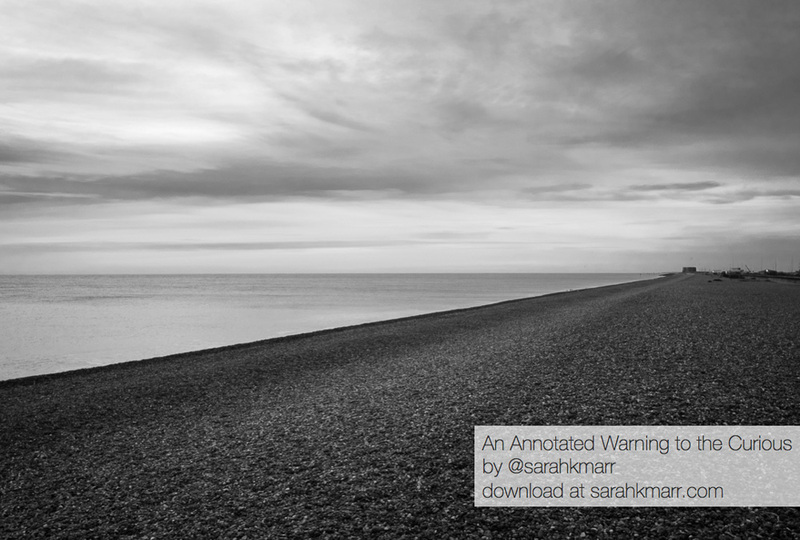 SM: I mention in the introduction to the “Annotated Warning to the Curious” that my mother’s unwell, and it was her desire to visit the sea which took me to Aldeburgh. I’d been there a couple of times before, so I had a rough idea of the place. I was also vaguely aware of the connection to James, and it seemed a good way to give the visit a focus; something to take our minds away from illness and into the landscape. The existing guides—particularly those by Darroll Pardoe and Adam Scovell—were a great place to start. 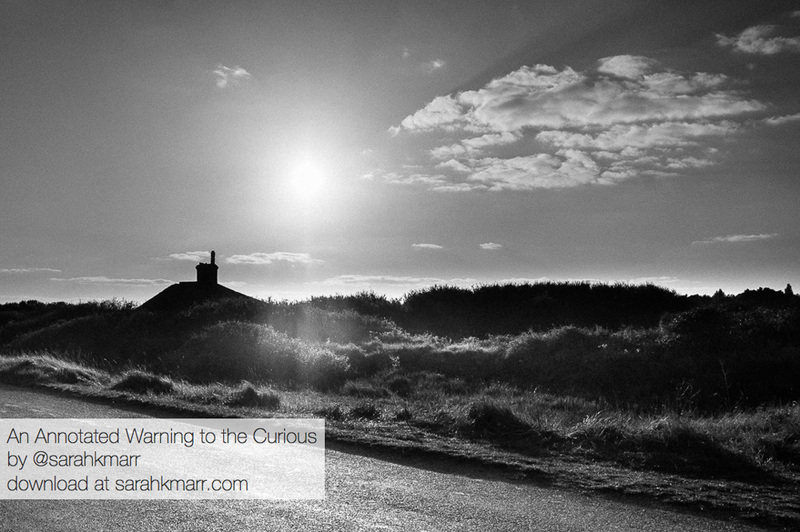 “A Podcast to the Curious” has two superb episodes on “A Warning…”, to which I listened on the journey to the coast. 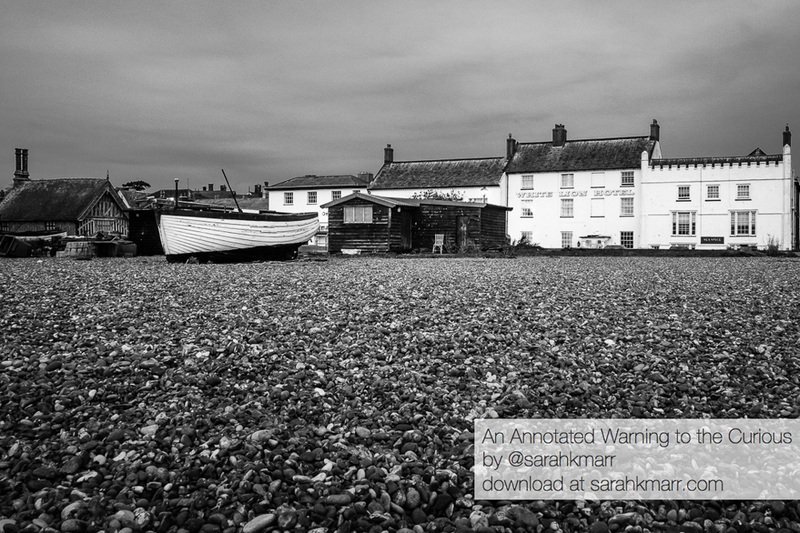 Those episodes include an interview with Tom Baynham about his own trip to Aldeburgh to find James’s inspirations. I owe them all my thanks. FHR: The wide-open landscapes of East Anglia seem to be especially inspirational for many writers of ghost stories. What is about the area that has prompted this? SM: I’m pretty sure that a full answer to that question requires at least a PhD thesis. I will say, though, that topographically it’s a haunting landscape: flat, unpeopled, windswept. It has about it some element of the Romantic sublime: simultaneously awesome and enveloping, desolate and beautiful. Then, the history of the place adds layer upon layer of meaning and interpretation, each leaving its own traces, building foundations for the next. So, the liminality of the place—the sense that it’s a hinterland for sea, marsh, and downs—extends beyond topography, back through time. All of this, somehow, brings its own melancholy, often hidden just beneath the surface, but always sensed. FHR: Did you sense any menacing presences over your shoulder or glimpse anything in the corner of your eye as you were wandering around the locations? SM: I’m one of those people for whom the oh-so-delicious ‘scare’ of horror is partnered with an irreconcilable discontinuity between fiction and reality. A lack of belief in the reality of what one’s reading should remove the ability for it to disturb, but it doesn’t, even as each perspective tries to undermine the other: somehow, it works. So, I’m not one for ‘presences’, but I am one for letting my imagination run wild and facing the consequences. Friston church, early in the morning, was cold and silent and gave me the sense that it’s never truly unoccupied. But for sheer Jamesian disquiet, the award must go to the walk through the empty marshes from Sluice Cottage (supposed home of William Ager) to Paxton’s dig site. Then, I confess, I did look over my shoulder from time to time. FHR: Such a huge amount of background detail is included in your guide that you must have spent many hours searching through dusty tomes in a manner reminiscent of James’ study of Medieval manuscripts. How many hours were you spent secluded in libraries? Equally how many days were spent traipsing up and down the lonely coastline seeking the locations? Half of my novel is set in 1887, and I used Google Books for a lot of contemporary texts for that, too, so I’ve had some practice. It’s a lot more effective for pre-c.1930 works, which are generally available as complete texts. Luckily, that covers the texts available to James, and much of his own output. The trick is to use the books one finds as one would if they were printed and taken from a library shelf: use their references to find other books, rather than relying solely on individual searches. Then the research grows more ‘organically’, and with more access to obscure details. It doesn’t help, of course, that searching for “M.R. James” turns up every “Mr James” ever printed: one has to go full “Montague Rhodes”. I do, though, have two printed and well-thumbed copies of The Collected Ghost Stories, a battered first edition of James’s Suffolk and Norfolk, an e-book of the Ash-Tree Press’s A Pleasing Terror, and a fascimile of the 1925 O.S. map of Aldeburgh. I can’t make the trip back to Aldeburgh at the moment, but when I can, I want to use the library there to get tide tables and weather reports and, if possible, to track down a picture of the battery which used to sit by the martello tower. As for traipsing, I had an afternoon and a morning in Aldeburgh. The afternoon covered the martello tower photographs and allowed me to scope out the rest of the in-town locations and the Sluice Cottage. The following day I got up at 6am and headed out whilst everyone else was asleep. That let me take the unpopulated photographs of the beach, the White Lion, and the churches at Aldeburgh and Froston. Then, after breakfast, there was time to visit Paxton’s dig site and Theberton church. I only identified some of the other locations, or potential locations—Thorpeness Halt station, Woolpit church, Walton Castle—when doing further research after the trip. Anyway, it is possible to see everything in a fairly short amount of time, and my hope is that someone following in my, and James’s, and Paxton’s footsteps can visit Aldeburgh with all the information they need in one place, and situate themselves within the story itself. FHR: Do you have any plans for further wanderings in the landscape of M.R. James? SM: Perhaps: I love this kind of research, and James’s stories have just the right balance of fiction and real-world underpinnings for it to be effective. I was in Somerset recently and, entirely coincidentally, found myself driving past the New Inn in Sampford Courtenay, Devon, which appears in James’s “Martin’s Close”. I have a rather prosaic photograph of it. (I’ve also got a set of then-and-now photographs of Avebury, based on shots in Children of the Stones, and I ought to do something with them.) But undertaking something as detailed as the work on “A Warning to the Curious” is more of a challenge, so I’ll have to wait and see what opportunities present themselves. Right now, my priorities are working on my own stories, and finishing a stage-/screen-play of “A Warning to the Curious”. I’d recommend the BBC’s 1972 adaption to anyone: although filmed in Norfolk, and although Paxton (played superbly by Peter Vaughan) is older than in James’s description, it does a phenomenal job of capturing the chilling essence of the story. Still, the layers in James’s tale mean there’s so much to bring out, and so many interpretations which can deliver real emotion without deviating from the text in any major way. I’m determined to explore them further. All I have to do now is find someone to stage/film it (and that’s always the toughest part). FHR: Thank you Sarah for taking the time to speak to us about your Jamesian wanderings and best of luck with your future writings, looking forward to seeing what you come up with next. The Dark Masters Trilogy comprise of a trio of novellas from acclaimed horror writer Stephen Volk, a member of the select group of Welsh writers alongside Arthur Machen, whose work is held in the highest esteem within horror circles. Volk is most famous for his scriptwriting work on Ken Russell’s Gothic, and above all else the BBC drama Ghostwatch. The Dark Masters Trilogy brings together three novellas, Whitstable, Leytonstone and Netherwood as a trio of dark tales of fiction constructed around a quartet of celebrated horror and occult figures from the 20th Century’s cultural past. Hammer legend Peter Cushing takes the lead role in Whitstable, a juvenile Alfred Hitchcock in Leytonstone and we get a twofer in Netherwood with both horror novelist Dennis Wheatley and Occultist Aleister Crowley squaring up to one another. Whitstable is up first. This is a story about the darker side of the 1970s that takes place in Peter Cushing’s beloved Whitstable in the period directly after the death of his much cherished wife, Helen. The story itself features some wonderfully written characters, and an interesting and well developed plot, however the real genius here is Volk’s touching portrayal of Cushing at this most difficult time in his life. The whole novella revolves around his incredible portrait of the horror legend as a broken man, the loss of his soul mate had rendered him a physical and mental wreck until a chance encounter with a young boy who mistakes him for the character he portrays on screen, the vampire hunter Dr Van Helsing. This leads to Cushing undertaking the role of investigator, delving into a crime that has been committed against the young boy, and saving himself at the same time. Leytonstone is a story based on the childhood of Alfred Hitchcock that examines the roots of his fascination with crime and punishment, the two factors that form the basis for much of his cinematic output. The story begins with the young Hitchcock incarcerated in a police cell for a crime he did not commit. His Father had him locked up for a night to teach him a lesson. This inspires the young Fred as he was known to further investigate these ideas of crime and punishment with severe repercussions for those involved. Once again this is beautifully written, Volk once again highlighting his incredible turn of phrase and attention to detail, as well as his incredible knack for writing wholly believable characters. Despite much of this story being fictional you feel as though you are delving into the mind of the real Hitchcock, such is Stephen Volk’s incredible talent for writing character. Netherwood is the final entry in the trilogy. Volk imagines a meeting between two of the most important figures in the Twentieth Century occult world, Dennis Wheatley and Aleister Crowley. Once again Stephen Volk has created a truly believable work of fiction by rooting it in facts. An aging Crowley requests the presence of Wheatley at Netherwood, the guest house in Hastings that was to be Crowley’s last resort. A visibly sick and dying Crowley requests Wheatleys assistance to complete one one final magickal working before his death. The interplay between the two men who never actually met in real life is excellent and you really do get the sense that this is exactly how these events would have played out had they actually happened. This is of course Stephen Volk’s greatest achievement, his characters are so well researched and developed that he almost instinctively knows how they would behave in almost any scenario. A rare commodity indeed and one that should be cherished. The Dark Masters Trilogy is a triumph, a beautifully written volume that takes the Twentieth Century’s most infamous practitioners of horror and the dark arts and places them into new scenarios. Stephen Volk has written three fictional tales, that are so believable as to be future urban legends, such is the power of his writing, the great attention to detail, and his knowledge of the history of horror and the occult. You simply can’t imagine these stories having the same impact in anyone else’s hands. 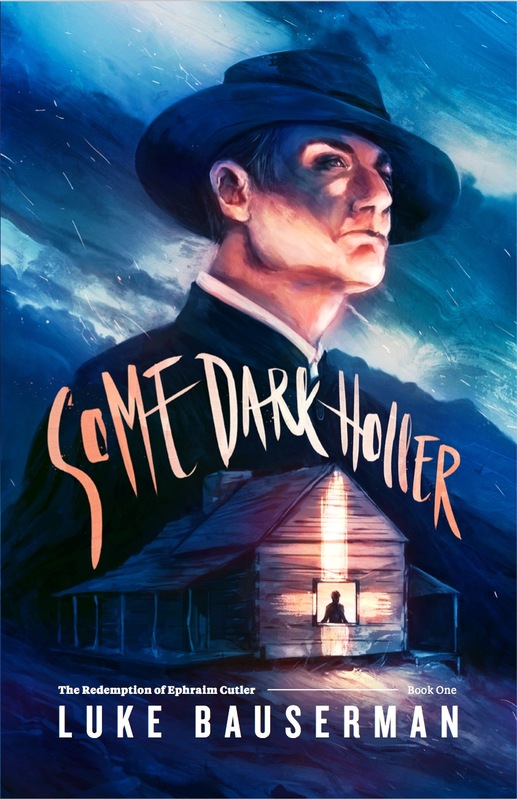 Each tale having its roots in fact provides a strong base for Volk’s writing, whether this is Cushing’s sad loss, Hitchcock’s incarceration, or Crowley’s final days at Netherwood. As many of you will already be aware, Stephen Volk is a visionary writer in the field of horror and these novellas are a very strong addition to an already richly acclaimed career. I simply cannot recommend these tales highly enough. The Dark Masters Trilogy is published by PS Publishing and is available to order from their website now at the link below. Any book of tales that includes one that starts with these opening lines and claims to have been collected by the author from the residents of Low Scaraby has surely got to be worth picking up and investigating? How right you are……. Read on and find out more about the author and about this marvellously intriguing and refreshing collection of 23 stories from the pen of Richard Daniels – in the shops from November 9th from Plastic Brain Press. Richard Daniels is a difficult writer to describe or fully understand. His stories seem more like dreams being recounted half-remembered and still full of possibility – snatches of brilliant ideas that many people would dismiss as `just ideas’ but in his hands they become fascinating and decidedly dark vignettes. In the same way that some of Bob Dylan’s best narrative songs seem to start half way through and end leaving you with 100 questions (think `All Along the Watchtower’, ` Frankie Lee & Judas Priest’ or `Lily Rosemary and the Jack of Hearts’) Richard’s stories use a similar technique to draw you in and have you investing in his tales. Folk Horror Revival managed to get a few words with Richard about his craft and in particular `Too Dead for Dreaming’ and as his responses show his unconventional approach to writing extends to interview responses too…..
“I’m not sure how I ended up writing. It was something that I always did one way or another. The killer blow came when I started to take it seriously. I think Freddie Mercury put it best when he spoke about Flash Gordon and I would apply the same standard. I’m just a man, with a man’s courage. Of course I haven’t saved the Earth yet. This eclectic mix of inspirations manifests itself in the stories in Richard’s latest book with tales that cover James Dean (on wheels), the death of a rock star, ghosts in machines as well as the lost city of Atlantis. What makes this spectrum of stories so intriguing is that tiny hints and links will peep out at you as you read which suggest that they are all part of a bigger story yet to be told. There is some real darkness in them there tales which opens up with a nihilistic rant that wouldn’t sound out of place on the lips of Frankie Boyle and ends with a nod to `The Never Ending Story’ but running throughout the book is a feeling of unsettling rural oddness which carries more than just a hint of Folk Horror. Does the author agree with this description though? “I think aspects of it certainly do. Taken as a whole I think it creates a mood which can be unsettling in some way. A lot of life is unsettling and the mind is a natural narrative creating machine, so it’s got to do something with all the chaos and weirdness that just doesn’t fit. The 23 stories in Too Dead for Dreaming are just an aspect of that. It’s very on trend currently to be working within the Folk Horror genre but this collection of stories doesn’t feel like it is trying to do that – it feels like folk horror’s presence in the pages of `Too Dead for Dreaming’ is not just a nod to the genre but a wider reflection on the influences that Richard draws on. “I recently went out on a night walk with my friend Tom. It was one of those late night expeditions where the darkness seemed made to be explored in the same way a dream you have is made to be explored. We had our torches – an essential folk horror piece of kit. Down a deserted country track we came upon a hooded figure on a bench with a beast keeping guard. Our hearts started racing and had we been out walking alone without each other for company I’m sure we would have turned back. The figure paid us no mind – nor did his beast. We ended up on the winding roads of an industrial park. Sure it could just have been a dog walker but I think it more likely to have been something more eerie and spectral. Some of this publication’s best `worms’ are the stories that deal with the possibly diabolical careers of a movie director and a rock star. By the time you have read them you will want to track down the film `Hexagasm’ and Chip Chatterton’s “hypnotic solo’ album `Lost behind the Rainbow’ so it is with a real sense of annoyance that you have to remind yourself that Richard has made all this up….I even e-mailed Plastic Brain Press for details on how to access the film `Hexagasm’ – I won’t spoil the fun by telling you what their response was. These two stories aside the subject matter covered in `Too Dead for Dreaming’ is so wide reaching that most readers will find a story that has that familiar feel for them whilst still having a fresh spin on it as part of the whole. I have read and re-read and still it feels like there are clues that I have missed which will help explain why Low Scaraby is a source of such marvellous tales – maybe Richard’s future plans will help answer these questions….so Mr D. what is next? I thoroughly recommend `Too Dead for Dreaming’ and thank Richard for not only providing a preview of his work but also for answering my questions. Before we sign off though I had one last question…. Do you have any particular book recommendations (not necessarily Folk Horror)? “If you’re a Folk Horror fan and haven’t already read A Year in the Country by Stephen Prince I think you would really enjoy it. I’ve recently read Graveyard Love by Scott Adlerberg which was great and set around obsession in a wintry graveyard. 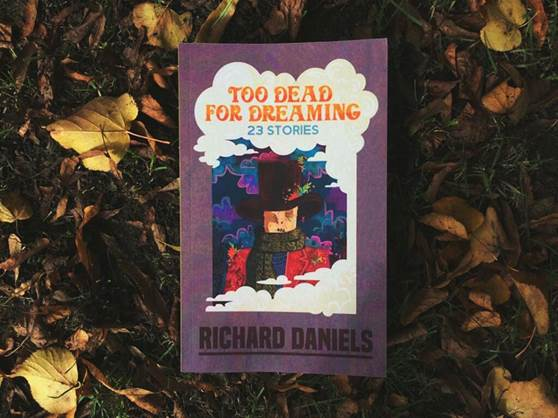 `Too Dead For Dreaming’ by Richard Daniels is out on 9th November and is published by Plastic Brain Press. For nearly five years the A Year In The Country project has been diligently producing field reports from the more haunted and folk horror inclined borderlands and wyrder areas of popular culture. Transmitting via their regularly updated webpage and issuing audio relics in the medium of themed compilation CD/ downloads featuring such artists as The Rowan Amber Mill, Sproatly Smith and United Bible Studies, A Year In The Country (AYITC) has amassed a valuable archive of all that is uncanny, unusual or unsettling in modern culture, whether it is film, TV, literature or music. Be it Bagpuss or Beyond The Black Rainbow, Shirley Collins or Sapphire And Steel, AYITC has documented these idiosyncratic yet highly significant moments in modern media. ‘an exploration of the undercurrents and flipside of bucolic dreams and where they meet and intertwine with the parallel worlds of hauntology; it connects layered and, at times, semi-hidden cultural pathways and signposts, journeying from acid folk to edgelands via electronic music innovators, folkloric film and photography, dreams of lost futures and misremembered televisual tales and transmissions’. Indeed, AYITC embrace a wide range of avenues to bring together not only a sense of how far reaching and varied the origins, mainstays and current players of genres such as folk horror or hauntology can be, but crucially also how they intertwine and cross pollinate. There are chapters therefore on 70’s acid folk and its impact and influence on today’s folk artists, on ‘Folk Horror Roots’ (including an entire chapter on ‘cultural behemoth’ The Wicker Man) but also on ‘Folk Horror Descendants’ such as Kill List, on apocalyptic popular culture through the decades (taking in the horrific The War Game as well as Frankie Goes To Hollywood) and on dystopian literature and cinema such as No Blade Of Grass, The Midwich Cuckoos and The Day Of The Triffids. Television series that have become a part of the folk horror conversation also feature prominently, such as The Owl Service, The Changes, Penda’s Fen and the influential Robin Redbreast (arguably a forerunner for The Wicker Man). Each chapter expertly charts its chosen subject’s impact upon the public consciousness as well as indicating that these artefacts are now part of a greater cultural cobweb that may well have threads and components that are radically different in genre or style but that equally have a strong commonality in their sense of unease and their haunted content; of similar ghosts in the machine (or spooks in the television and bookshelves). Further investigations delve into folklore, TV public information films and the landscape itself as a medium through which a certain mood, an uncanny, can be evoked. There’s not really an overarching and definitive name for this “broad spectrum” of work but in that article he describes such “eerie counter-culture” as being an occulture; which seems appropriate and connects to the earlier mentioned sense of the hidden within such possibly disparate seeming work as some of the roots of the word occult are from the older French word occulte meaning “secret, not divulged” and the Latin occultus which means “hidden, concealed, secret”. I’m wary of seeming overly serious (!) about such things; to a certain degree you could see such cultural exploring as in part a form of grown-up make-believe and world creation, a form of escapist fun. At the same time and connected to the above comments by Robert Macfarlane, that escapist aspect may also at times have roots in more serious areas in that such intertwined work and the worlds it creates could be seen to also create a bulwark from what some may see as the more potentially overwhelming, rapacious or secularly monotheistic aspects of modern life, culture and dominant belief systems. “A re-imagining and misremembering (that creates) forms of music and culture that seem familiar, comforting and also often unsettling and not a little eerie, creating a sense of work that is haunted by spectres of its and our cultural past…” (P. 27-28; from a section in ‘Wandering Through Spectral Fields’ that brings together some of the recurring themes of hauntology and which could also be applied to work which explores the flipside/undercurrents of folkloric culture). The flipside of folk/pastoral culture and hauntology seem to interconnect to create those familiar but also reimagined, unsettling, eerie and spectral aspects; creating a cultural harvest that on paper and technically you would not expect to, as you also say, cross pollinate but which has proved curiously and intriguingly fertile and hardy. FHR: Can you say more about your motivation for producing ‘Wandering Through Spectral Fields’ and the possibility that this may just be a first volume of many? SP: In terms of why I produced ‘Wandering Through Spectral Field’s as a book separate from the AYITC website; at heart and in part it’s not all that much more complicated than it was a book that I wanted to read, that I found myself looking for over the years. Previous to and since its publication/I finished writing it there have been a number of books released which have explored some similar areas but they have generally more tended to focus on one particular area of related culture; semi-consciously I wanted to bring all these different aspects together as, well, they seem to fit, interconnect and influence one another. Online and print orientated publishing both have their pros and cons, their strengths and weaknesses and I’m not didactically more inclined towards one or the other but the more possibly curated, edited etc aspect of a book can bring a particular theme or set of themes into focus – or again as you say, on reading a collection of writing in book form it is hopefully possible to “see how they become part of a larger cultural tradition”. In terms of ‘Wandering Through Spectral Fields’ possibly becoming part of a series of books; we shall see (!). The AYITC webpage continues to be updated with new thoughts and recollections, new features and films, books, television and music that seem to exist either in a more liminal space outside of the mainstream or that instead occupies the mainstream in a more liminal and unusual manner. Seek it out if you are not already a regular visitor. And for those who favour a little Quatermass with their Wicker Man, a touch of Belbury Poly with their Incredible String Band or a taste of Children of the Stones with an offering of Chocky, this volume is highly recommended. With thanks to Stephen Prince for his time and answers. ‘Wandering Through Spectral Fields’ is available from ayearinthecountry.co.uk as well as Amazon. Witch Cults T-Shirt Now Available to Preorder. The news that our rather wonderful new Folk Horror Revival – Witch Cults shirt is now available to order has been received with great delight here at FHR towers. The admins are frothing at the mouth over the beautiful new design created especially for the event by Andy Paciorek and Cobweb Mehers, in conjunction with Jonas at Tyrant Designs who has done a remarkable job with the manufacturing of these individual pieces. If you are planning to join us on July 14th and would like to preorder your shirt, either contact Kt Mehers via PM on Facebook, or email us at folkhorrorrevival@gmail.com, please include a contact email address, a delivery address and your chosen size. The shirts are available in size S, M, L, XL and XXL and are priced at £15. These can be collected at the event. Those who can’t make it can still order a shirt, postage and packaging is priced at £6, and please state in the message that you require the shirt to be posted out to you. Another announcement is due in the next few days so keep your eyes open, however if you want to get in early tickets are currently available from the eventbrite link below, priced at £27.54 for the full day event and £16.76 for just the evening. Ephraim Cutler is a 16 year boy, living in the backwoods of Appalachia in the aftermath of the American Civil War. His mother hasn’t been right since his father was killed in the war, killed by a Union bullet. She blackmails him into taking revenge by killing an innocent Yankee, so Ephraim, forced to choose between killing an innocent man or the death of his mother, commits murder. To try and redeem himself, he flees into the forest, but unknown to him, there’s more powerful and sinister forces than the local townsfolk after him, and soon he has a hellhound on his tail. Some Dark Holler is richly evocative of it’s setting, drawing heavily on Appalachian folklore. I found this to be one of the most interesting aspects of the book, seeing how traditional European beliefs had changed when transplanted to America; the hellhound is a real dog reanimated by a black magic ritual rather than the spectral hound you may be more familiar with, there’s also a granny doctor, an old woman wise in the ways of healing, similar to the wise women of old. It certainly made me want to find out more about the folk tales the author drew on. Luckily, he’s produced a book on this very subject, which is available free from his website, which I’m looking forward to reading. The plot itself moves along at a fair old gallop, with a fair few twists and turns. Although it’s the first book in a series, it’s satisfying as a stand alone book. I’ll certainly be picking up the sequel when it comes out this year. More info at www.lukebauserman.com, where as well as his previously mentioned ebook, the author also blogs about local folklore, so well worth checking out. Where better to spend an engaging winter’s evening in the company of the Folk Horror Revival group, than in the beautiful coastal town of Whitby. This event promises to be one of the highlights of the wyrd calendar, and is most definitely not to be missed. In the intimate setting of The Metropole, Whitby, we cordially invite you to join us for our winter soiree, a gathering of the clans on the North Yorkshire coast. 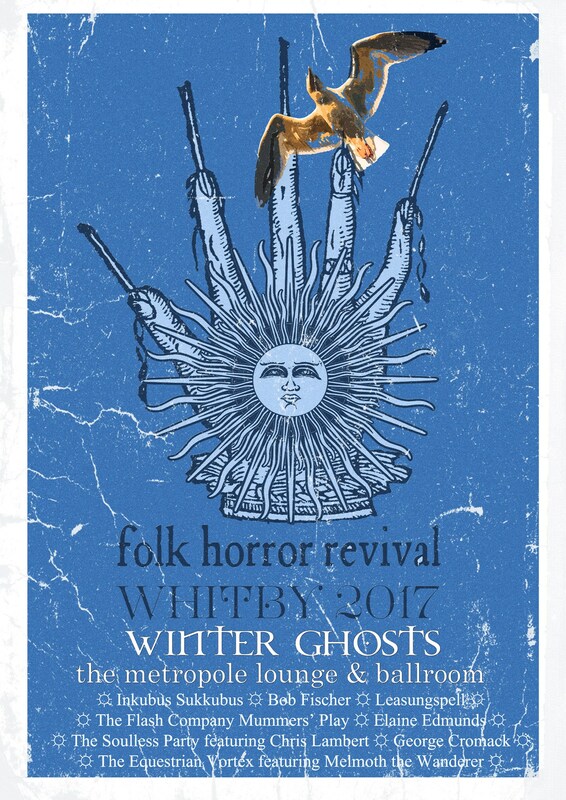 Folk Horror Revival present a series of exhilarating talks and musical performances for your terpsichorean pleasure. Beginning at 4pm, the event gets under way with a series of thought provoking oratories with a distinctly local flavour, before we plunge headlong into an evening programme of esoteric, auditory treats for the soul. The chances are, you are more likely to have heard of Austin Spare than you have of Madeline Montalban. Saying you’re into the work of Austin Osman Spare these days is like saying you’re into the work of Throbbing Gristle, or Nico’s solo work, or Scott Walker’s late era: sure, it’s not a household name, but he’s not exactly unfamous either, and if you have even a passing interest in the occult these days the chances are you’ve heard of him. And that’s OK! His posthumous reputation, although largely mythologised, is deserved. For my part, Madeline Montalban was part of the furniture of my life since childhood. I could have told you who Madeline Montalban was when I was nine. Dad’s jumbled up collection of Prediction magazines meant that I rarely read them in order; I’d find them in caches around the house, all mixed up, and I don’t recall reading her obituary as a kid (although I must have: It’s in the issue with the picture of Battlestar Galactica on the front that includes Doreen Valiente’s article about the Necronomicon). I remembered her mainly as having written most of the articles about the Tarot, mysterious and forbidden. I had seen Austin Spare’s art before I’d known his name. The lascivious, bare-breasted and faintly malevolent Isis Unveiled on the cover of my Dad’s copy of Francis X King’s Magic: The Western Tradition and several of the illustrations within, that was Spare. Phil Baker’s Austin Osman Spare: The Life and Legend of London’s Lost Artist(Strange Attractor Press, 2012)is about as comprehensive a biography as one could want of anyone, exhaustively researched, annotated and indexed. It’s a useful reference work without once being any less than enthralling. It’s the sort of thing people call a “tremendous achievement”. Austin Spare (1886-1956) was feted as an artistic genius in his teens. It didn’t work out for him. He crashed out of Crowley’s Argenteum Astrum. W B Yeats (who always seems to come off like a colossal prick in anything I’ve read) picked a fight with Spare over the illustration of his poems. Spare tried to launch magazines and exhibit work, and founded his own magical system. As time went on, his star waned, and a succession of reversals and misfortunes beset him, culminating in him getting bombed out of his home and losing everything during the Blitz. He ended up in poverty, but kept ploughing his furrow, in magic and art. 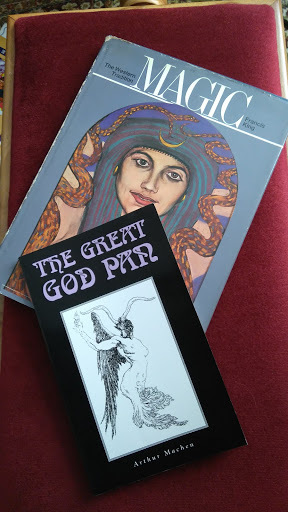 He exhibited his paintings in pubs, and in his final few years got tangled up with the flamboyantly imaginative artist/occultist Kenneth Grant who, it’s fair to say, is the reason for Spare’s enduring fame and influence over the occult scene as it is today, particularly through the growth of Chaos Magic. A good biography needs a linchpin, an idea that forms its heart, and Baker, right from the beginning, stresses that Spare was above all a Cockney. This serves as an effective centre to his story, if not for the unfortunate effect of causing me to imagine Spare’s voice being exactly like the voice of the Phantom Cockney from The Mighty Boosh (I respectfully submit that should the all-too plausible BBC4 dramatisation of his life ever come to pass, Noel Fielding is a shoo-in for the title role). I wonder if Spare ever met Madeline Montalban (1910-1982). Certainly their circles overlapped: she knew Crowley, Gardner and Grant to some extent or other. But I think that if anyone described her as a witch, pukka or otherwise, they would have been subject to her wrath to an exquisite degree. 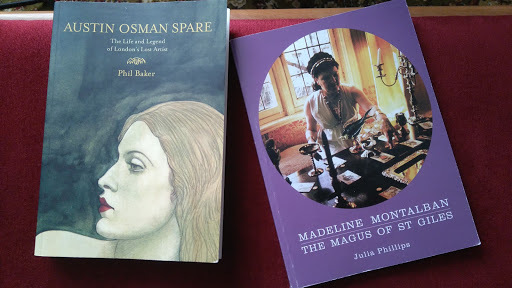 This was not, as far as I could tell from Julia Phillips’ biography, Madeline Montalban: The Magus of St Giles (Neptune Press, 2015), an altogether unusual occurrence. Montalban was, it seems, a fierce presence, capricious and mercurial, and yet truly beloved by her friends and students. Looking at the issues of Prediction I have which carry her work, all of which come from the last five years of her life, none of this comes as much of a surprise. She wrote most of the astrology section (although towards the end she got a colleague to ghost it for her), had a regular column on the Tarot, and every issue supplied a piece in the middle of the magazine that was only ever called in the contents “Madeline Montalban’s long astrology article”. These articles were not always astrology. Looking at them in recent years I’ve often felt that she just turned in whatever the hell she wanted just because she could, and knew they’d pay her to print it, whatever. It doesn’t matter: these articles are almost entirely pretty great. It went both ways, I suppose. Prediction trusted her to bring in the esoteric goods just as much as she trusted them to print her writing. Prediction was still publishing articles by her at least into May that year, although interestingly, one of the last articles she supplied, “The Throne of Understanding”, a cracking piece about using the Old Testament of the Bible as a grimoire, was printed twice, in the February and March 1982 issues. No reference is made to that mistake in any of the issues I have (although I’m missing June and July of that year, so it might be in there). My own writing is heavily influenced by her. I owe her an awful lot. Phillips’ biography of Montalban is barely a quarter of the length of Baker’s biography of Spare. It neither has a table of contents nor an index and it’s arranged by rough topics rather than chronologically. I think that’s a deliberate choice: It’s apparent that the bulk of Phillips’ research relies heavily on first hand accounts of Madeline Montalban’s life from people who knew her and survived her, and this necessarily means that the book skews towards living memory, and hence the latter half of her life. By avoiding a chronological structure, Phillips also avoids a more obviously lop-sided book. And it’s the right decision. I mentioned Austin Spare’s encounters with Gerald Gardner before, mainly for the sake of comparison. Here, there’s an entire chapter on Montalban’s association with the founder of Wicca, including evidence in Gardner’s own handwriting that he had also consulted Montalban on the subject of avoiding curses. It seems that she was a close associate with Gardner, especially during the writing of High Magic’s Aid, Gardner’s pseudonymous Wiccan ur-text (it’s originally credited to “Scire”) written as fiction for the simple reason that in 1949, witchcraft was still illegal in England. It’s incontrovertible that Montalban was Gardner’s typist and sub-editor. According to Phillips she claimed right up to her dying day that she actually ghostwrote the whole thing, based on Gardner’s jumbled notes. The whole affair is further complicated by Montalban’s refusal to have anything at all to do with Wicca after Gardner’s death in 1964, even to the extent of cutting off the late Michael Howard (a writer on magic, not the Tory grandee) for a few years after he was initiated into a Wiccan group. Phillips gives getting to the bottom of why this happened her very best shot, but, dependent on recollections of Montalban’s surviving friends and pupils, she has to throw up her hands and let the mystery remain unsolved. And this is largely a problem Phillips faces, which Baker doesn’t. Austin Spare is heavily documented, both in his own words and those of others, as presented in contemporary accounts from throughout Spare’s life, and Phil Baker is able to show with sensitivity and depth how the man changed over the decades; Julia Phillips’ Madeline Montalban is in some ways frozen in the memory of those who knew her, in the way that the beloved people we lose over the course of our lives so often are. With so few accounts contemporary with the earlier phases of her life, we largely see the final twenty-five years or so, and what we see of her earlier life is through the lens of that later period. This isn’t Phillips’s fault. Her perspective depends on what she had to work on, and personal retrospective, with all its problems, is the bulk of that. In her lifetime, Madeline Montalban was undeniably far better known than Austin Spare was in his, but their afterlives seem to have afforded them opposite trajectories, I think. Spare, richly documented and mythologised, is collected by celebrities and rock stars and thanks to Kenneth Grant and Pete Carroll, is now very much part of the furniture of the occult stage. Montalban might have been published every month in an internationally distributed print magazine during the peak life of print and the heyday of public interest in the occult, but barely three decades after her death, her life is already beset with lacunae, her early existence a cipher, beloved and well-remembered in anecdote only by survivors and committed enthusiasts. The record of her role in the history of twentieth century British occultism is in danger, even with work like this, of being forgotten. Her unwillingness to publish her writing in a more permanent form is part of it, I think; she refused to write in book form on principle, according to Phillips. As a result, her legitimately vast body of work (for example, in five years’ worth of magazines I have easily a couple hundred pages of text by her) lies largely in ephemera, in pamphlets, correspondence courses and mainly in a magazine that, reduced to a shadow of its former self, finally ceased publishing about four years ago. In a world where it seems that most things are always available in print or PDF, Madeline Montalban has become increasingly hard to track down. Of course, one wonders if she would have had more acolytes and prophets had she not been a woman, a disabled woman at that (she’d had polio as a child, with the consequences that brought), and a powerful, awkward, difficult figure. History is kinder in general to difficult men than it is to difficult women. We call difficult men free thinkers and iconoclasts, grand, heroic labels. We call difficult women bossy and selfish, diminutives designed to make them seem childish and ridiculous. It’s easy to do. She mattered. I suspect that it goes against her own wishes (and hence against the wishes of her literary executors) but I can’t help thinking that perhaps someone should compile Madeline Montalban’s writing into a more permanent form before it vanishes altogether. Before we lose her entirely. A version of this article was originally published at Chariot (chariotrpg.blogspot.com).